CARBONDALE, Ill – University students from around the state will come to Southern Illinois University Carbondale later this month with the goal of developing strategies to revive and rebuild Illinois. 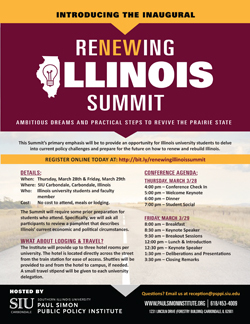 The Paul Simon Public Policy Institute is hosting “Renewing Illinois Summit: Ambitious Dreams and Practical Steps to Revive the Prairie State” on March 28-29. Limited registration remains, and organizers anticipate about 35 professors and students will participate in the conference at the Student Center. Reporters, photographers and camera crews are welcome to cover the “Renewing Illinois Summit: Ambitious Dreams and Practical Steps to Revive the Prairie State” March 28-29 in the Student Center. For more information or to arrange for interviews, contact Cary Day at the Institute at cbryant7@siu.edu or 618/453-4008. John T. Shaw, Institute director, said critical decisions are ahead for lawmakers with Illinois having a new governor and Democratic-controlled general assembly. “Illinois is at a crossroads as a new administration takes power in Springfield and confronts a myriad of serious challenges. Policymakers must decide if they will tackle these problems or defer them to another day,” Shaw said. The future of higher education in Illinois. Illinois’ political climate and future. Participants are receiving a 24-page report put together by longtime state government and political analyst James Nowlan and the Institute: “Renewing Illinois: From leader to laggard, and back again?” to review and use as a guide for the conference. The report discusses in detail the state’s issues and touches various topics including tax burdens, the state’s neglected transportation network, the history of political corruption and finding ways to fund higher education and stop student flight. Shaw said Institute officials developed the plan for the summit as a way to engage students from throughout Illinois in generating fresh ideas for lawmakers and state officials to consider. After the summit, a report highlighting the main conclusions and recommendations will go to Gov. J.B. Pritzker and leaders of the Illinois General Assembly. March 28 – 5 p.m., Sam Wheeler, Illinois state historian, will place Illinois’ current challenges into a historical perspective. March 29 – 8:30 a.m., James Nowlan will discuss Illinois’ current political and economic challenges. March 29 – 12:30 p.m., Erika Harold, a Champaign attorney who was the state’s Republican nominee for attorney general in 2018. She will reflect on her experiences on the campaign trail and offer her views on what Illinois voters are asking of their public officials. The event is part of the Institute’s Renewing Illinois Initiative, which examines ways to improve public policy in Illinois. For more information on this event or other Institute programs, visit paulsimoninstitute.siu.edu or call 618/453-4009.